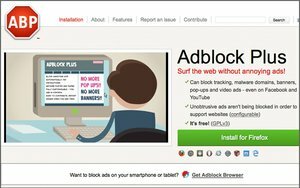 Ad-blocking tool Adblock Plus announced it has surpassed 100 million active installations. (It’s calling them users, but it counts downloads on multiple devices as different users.) The company said it had surpassed 500 million downloads with 50 million active users at the beginning of the year, meaning that the active user base has likely doubled since that time. Most advertisers will tell you that it’s the ads that intrude on and disrupt user experience, driving users to ad blockers. “We’re in this mess because the IAB has failed to create an advertising ecosystem that is sustainable and healthy,” Till Faida, CEO and co-Founder of Eyeo, Adblock Plus’s parent company, said onstage at Tech Crunch’s Disrupt NY 2016 conference. Adblock Plus runs a white-list program called Acceptable Ads that allows certain advertisers through its screen. The company gets a cut of publisher’s revenues through that program. Ad blocking has been a buzzworthy topic of conversation among those in the ad-tech business since last summer, when Apple’s announcement that it was including ad-blocker extensions on Safari for iPhones. Some have said that the threat to the ad business is negligible; others claim users are voting with their dollars and that advertisers have to take their feelings into consideration as they consider an update to the ecosystem. 4 comments about "Adblock Plus Reaches 100 Million Active Installations". Leonard Zachary from T___n__, May 9, 2016 at 5:16 p.m.
Forbes is a Dinosaur and I'm a print subscriber! Virginia Suhr from Lobo & Petrocine Marketing, May 10, 2016 at 10:15 a.m. It seems very wrong that AdBlock Plus would have a "white list" of advertisers. It just adds an extra cost to advertising because I'm sure that "fee" will be passed along to clients. It just seems like AdBlock Plus is resorting to exortion and once everyone signs on to an ad blocker, they are still going to get ads. I believe the main reasons people block are because the ads take over the content experience and it interfers/slows down their data stream. And a third reason is that some people think advertising and corporations are bad things in general. By blocking the ads, it makes them feel like they are in control of their internet experience. Michael Schmidlen from Of Eleven Media, LLC, May 10, 2016 at 11:39 a.m. The adults in the room better get together and get this issue resolved, sooner rather than later! Christopher Weakley from Virgo replied, May 10, 2016 at 1:16 p.m.
Virginia, I agree with your comment. Maybe after AdBlock builds a profitable "white list" of advertisers, it will offer a premium version of the app that allows consumers to strip out the whitelisted ads — for a price.